Our Story: Guess what's new! If you guessed that it has something to do with our permanent place of residence, great job! We received word from the developer that the plans were completed yesterday. 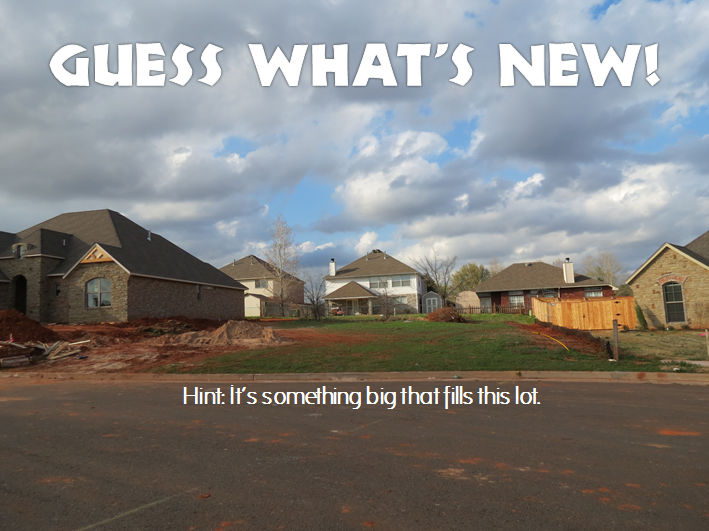 They took it to the city of Edmond today to get the permits, and they will start to break ground really, really soon. Possibly even tomorrow, so fingers crossed! To celebrate, we have finally launched our website with all of our information. I did a post on it back here when it was in beta, but it will now be kept updated (as well as this page) with pictures and other fun stuff. I recommend bookmarking it, but you can always access all our stuff through the blog that you are reading right now. Camera Equipment: this is the most recent purchase, since we wanted all our friends to have the best viewing experience possible. Purchased for a very reasonable price from Sam's Club, I'm sure you will enjoy the picture quality and looks alike: the Canon Powershot SX40 HS. Also, our tripod got shipped, so Dad had a real fun time picking out this tripod: Tagus Black Label 60" Pro Tripod for Camera and Camcorder. At any rate, the photos are a testament to the camera, I'd highly recommend it. I apologize for not keeping the blog up to date as well as I should have been, however I was not expecting the drafting process to take so long. We should be hopping along in here now, so check back for more pics! So happy to hear that things are settling down. Looks like a great lot for your new home. We miss you alot!